There are two forms of reversible acetylcholinesterase inhibitor which include edrophonium and pyridostigmine. Reversible acetylcholinesterase will lead to elevation of the level of acetylcholine which overcome the anti acetylcholine receptor antibodies. This will lead to activation of the neuromuscular junction. Edrophonium is useful in diagnosing patient with myasthenia gravis. Edrophonium involves in tensilon test. 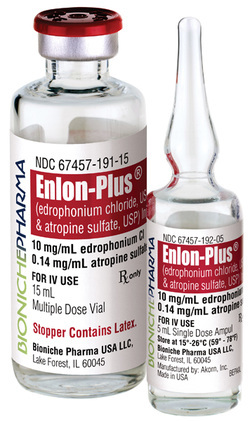 In Tensilon test, edrophonium is given to the patient. If the symptoms improve then , the patient may suffer from myasthenia gravis and the Tensilon test is positive. Tensilon test is also useful in differentiated between overmedication results in cholinergic crisis or under medication in treatment of myasthenia gravis. Patient who is overmedicated with pyridostigmine and under medicated may experience symptoms such as fatigability and weakness of the muscle. In this case, edrophonium is given. Pyridostigmine is also useful as a long term drug which is useful in treating patient with myasthenia gravis. Both of these drugs will reversibly bind and inhibit the action of enzyme acetylcholinesterase. The level of acetylcholine will be elevated and increase in the stimulation of the nicotinic and muscarinic receptors. Atropine is useful in overdose of edrophonium or pyridostigmine. The common side effects may include diarrhea, bronchoconstriction, nausea, flushing, salivation and bradycardia due to increase in stimulation of the muscarinic receptors.